Okay, NOW I’m actually sharing the recipe for the pictures I taunted you with on Monday! 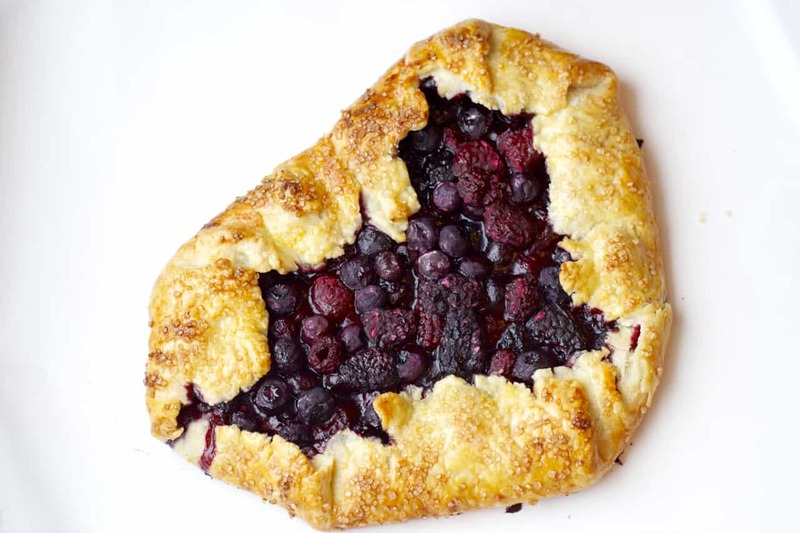 A quick and easy, amazingly tasty, mixed berry galette. Shaped like a heart! Well, sort of. I lost the heart shape a bit when it was baking, but it still resembles a heart I think. Maybe not perfectly, but you can tell what I was going for! Right? At any rate, it’s very, very tasty. And that’s the most important part. And if you make it on Valentine’s Day, everyone will know it’s a heart anyways! Or you could just make a regular circle galette. It doesn’t really matter. Either way it will be an absolutely divine dessert for your Valentine’s Day. It’s pie, but easier! I mean really, all you have to do is roll out the pastry. The shape doesn’t really matter all that much, you don’t have to transfer the dough to a pie plate and then try to crimp the edges all beautifully. Just roll, toss on the fruit and fold up the edges. Simple. I may be making galettes from now on rather than pies whenever I get the hankering for a slice of pie. This was just too easy! Especially since I had pastry waiting in the freezer for me to use. This mixed berry galette was literally ready to bake by the time the oven warmed up. That’s a fast dessert. And so cute! Right?! You can’t go wrong with a heart shaped dessert. Especially when it’s quick and easy pie that tastes like it was a lot of work – but really isn’t. Try this galette, you won’t be disappointed! I am away this week, but will be back next week to respond to any questions or comments! Thanks! In other news, I’ve finally joined the rest of the world on Instagram, so if that’s your thing, come say hi! In a medium bowl, toss together the mixed berries, sugar, corn starch, lemon juice and salt. Set aside. On a lightly floured surface (I just used the silicone mat that I was going to bake the galette on so I wouldn’t need to transfer it! ), roll out the pastry to a large circle, about 1/4 inch thick. Place the fruit mixture in the middle of the pastry, leaving 2-3 inches of pastry all around the fruit. Fold up the edges of the pastry over top of the fruit, pleating the pastry as you go around the fruit. 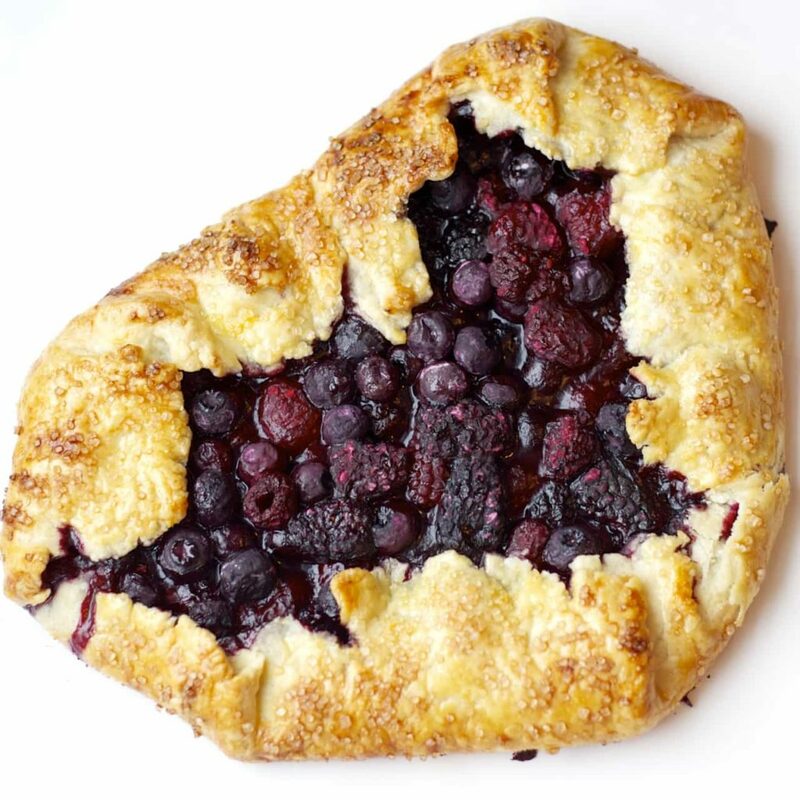 If you’d like to make a heart shape, just spread the fruit in the center in a heart shape, and then fold the pastry over, pleating it to make it fit around the heart shaped fruit. 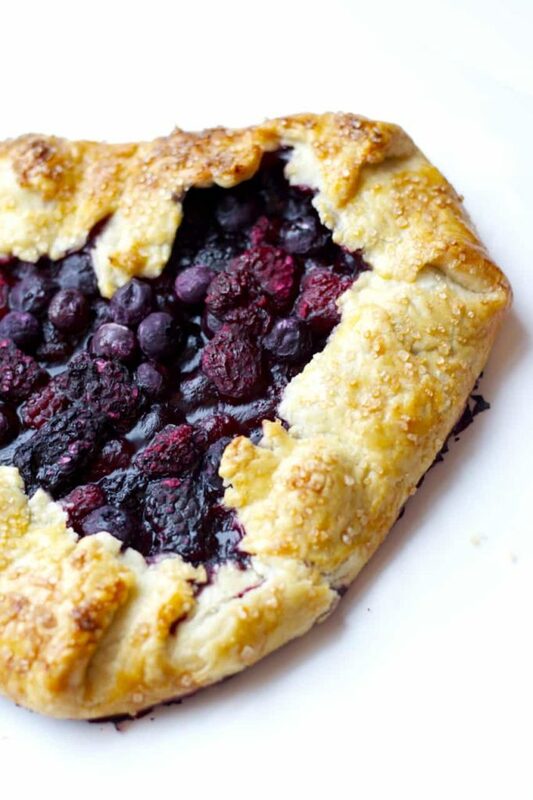 At the top of the heart, you will need to cut the pastry slightly to keep the heart shape. Whisk the egg yold and the water together, and brush the pastry with it. Sprinkle with the coarse sugar. Bake for 35-40 minutes until the fruit is bubbling and the pastry is browned. Let sit for 10-15 minutes before serving to allow the fruit to set. Source: Adapted from Smitten Kitchen . Yum, this looks so good! I'm always on board with anything that's easier than baking a pie so I should definitely give galette's a try. This galette looks gorgeous! I love how easy it is and the mixed berry filling sounds perfect! It was so fast and easy - I think that was my favourite part! Thanks Kelly! I love adding coarse sugar on pie crust, the crunch and the sparkle really add to it! Thanks! This is sooooo cute, Stacey! And I love how pretty it is, but still has sort of a rustic feel. It's beautiful! I've never actually made a galette, but now you've convinced me to put it on the list! Have a great trip - wherever you are! Thanks Sarah! You definitely need to put galettes on your to-make list (everyone has one of those right?! ), they're so fast and easy. Way less messing with the pastry to get it perfect! And just as good as pie! This is such a pretty tart! This is still romantic for Valentine's day even without any chocolate! I love galettes Stacey...they are so easy to make + so delicious! Your look perfect! Thanks so much Manali! They're SO easy, I love them! I love how easy this is, Stacey! I think I would definitely make galettes over pies, too. So gorgeous and looks delicious! It's just so much faster than a pie, although a bit messier I suppose. That's okay though, the speed makes up for it! Thanks Gayle!